The R3467/3477 signal analyzers are high-performance spectrum analyzers.With our proprietary RF technology, the signal analyzers achieve an average display noise level of –158 dBm*1 and third-order intermodulation distortion (TOI) of +26 dBm*2. The wide dynamic range that they can measure is unprecedented. Their noise correction function enables measurement of a wide dynamic range of –86 dBc (representative value), especially useful in measurement of the adjacent channel leakage ratio (ACLR) of 3GPP (W-CDMA). 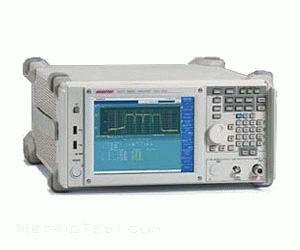 In addition to RF measurement, the R3467/3477 has a broadband modulation analysis function (25 MHz bandwidth) as standard. By adding signal analysis options, each of which is dedicated to a different communication system, the R3467/3477 provide expanded functionality and can be used as a transmitter tester.